Led Zeppelin were one of, if not the biggest band in the world during the 1970s. Formed in 1968 from the ashes of the Yardbirds (and initially going by the name of the New Yardbirds), session guitarist and final Yardbirds axeman Jimmy Page put together a new band in order to fulfill the musical vision he had been turning over in his mind for years. In bringing in Robert Plant, John Paul Jones, and John Bonham, he created the perfect band for what he wanted to achieve. Their almost overnight success into one of the biggest selling and most popular bands in the world by the end of 1969 is an incredible story, as is the rest of their career. Shrouded in mystery and intrigue, the Zeppelin story has captivated people for decades (myself included), with fact and myth intertwining often to comically inaccurate effect. However, while there have been several books written about the band, these tended to be heavily sensationalized accounts of the band's career, mainly focusing on their on-the-road debauchery and behind-the-scenes scandal. In particular, former road manager Richard Cole's Stairway to Heaven and writer Stephen Davis' Hammer of the Gods fall into this camp, both riddled with many inaccuracies and criticized by Plant, Jones, and Page. They tend to be notorious more for their shock value than anything of serious substance about the band. Thus, for such an important and influential band, there has never really been a definitive and well-researched book on Led Zeppelin. 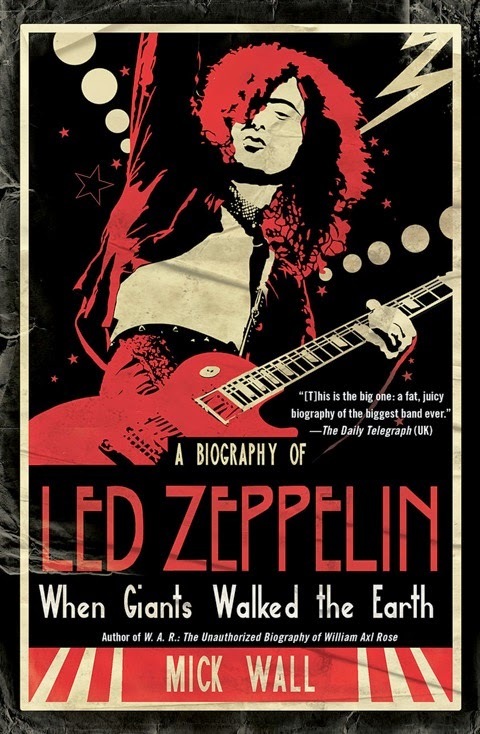 That is the reason why, when I heard of the publication of When Giants Walked the Earth a few years ago, I was very excited and interested in reading it to see if the true story of Led Zeppelin would finally be told the way it deserved to be told. Mick Wall is a well-known music journalist who also happens to have been a friend of the band for many years. Drawing on years of research and personal interviews with the principals involved, he's written this biography, albeit in a rather unique format. While the bulk of the book is made up of the narrative of the band's story, there are italicized sections interspersed throughout each chapter. As explained by the author in the introduction, while these sections are not told in the words of the band, they are based on factual research and Wall has approximated what he thinks they might say via his own imagination. I'll return to this device as it's one of the main things I'm conflicted about with regards to the book. Any history of Led Zeppelin has to focus on Jimmy Page as the driving force within the band, seeing as he was their visionary, the de facto musical director, and producer of all of the band's music. While Wall does an admirable job telling the story and giving equal time to all four band members when it comes to the meat of the Zeppelin story, when focusing on their personal lives, he spends the lion's share discussing Page. Mainly, he delves with impressive detail into Page's nearly lifelong fascination and devotion to the life and teachings of Aleister Crowley. For better or worse, Page's interest in the occult and magic has been a lingering and omnipresent aspect of the Zeppelin story, with many people over the years going so far as to imply that the entire band were involved in some sort of devilish magic to explain not only their meteoric and rapid success, but to also rationalize the almost constant stream of dark and shadowy circumstances that dogged the band, especially during the last phase of their career (1977-1980). While the author doesn't wholly buy into this (nor do I), he does approach Page's study of the occult from a more scholarly manner and it makes for fascinating reading. In particular, while many criticisms of this book decry the amount of space devoted to this discussion, I found it interesting and, based on what I think the author was trying to achieve with it, it describes a lot about Page's personality and approach to life, music, the band, and the general way he conducted his life. Thankfully, Wall doesn't resort to playing up the occult aspect (or the road debauchery) the way it's been portrayed in Cole's and Davis' books (among others), which help to keep the book on an even keel. Because of this approach, the reader can take this book much more seriously than those other two books. As mentioned above, Wall draws on years and years of personal interviews with the members of Led Zeppelin, manager Peter Grant, and others who worked with them over the years (in various capacities) in order to present the complete and true story of their career. Beginning with the decline and end of the Yardbirds in mid-1968, crumbling around Jimmy Page after he finally traded session work in for a spot in a real band in 1966, Wall goes into detail as to the mindset and approach of Page and Grant as they plotted creating a new band which could fully realize the musical vision Page was steering the Yardbirds toward when they split up. The book does an excellent job telling how the band came together and what the mindsets were of the four when they united, as well as where they were at in their various careers (and how they got there). From there, the tale of Zeppelin's flight continues chronologically, through every album and tour, and every high and low. In addition to the well known tales (such as the "Mudshark Incident" from 1969), new bits of information were shed on such high points as the creation of their landmark albums Led Zeppelin II, IV, and Physical Graffiti, as well as the low points like the disaster that was (most of) the 1977 US Tour and it's ridiculously tragic ending that resulted not only in the arrest of Bonham, Grant, Cole, and John Bindon for the savage beating of one of Bill Graham's employees, but the sudden death of Robert Plant's son. Thankfully, Wall doesn't end the book with Bonham's death and the official split of the band in 1980; he also chronicles the scarce few times they've gotten back together since then, most recently (and seemingly for the final time) in 2007. Throughout it, the picture he paints is striking in its dichotomy: whereas Robert Plant was, in 1968, the provincial Northern lad unsure of himself and lacking confidence, since the end of Led Zeppelin, he has been the most successful, critically and commercially, of the former members, and he's the one who is the most secure in who he is and where he is in life, refusing to live in the past and resurrect Led Zeppelin. Conversely, Jimmy Page, who was the oldest, most experienced, and confident member, the one who put the band together in the first place, has spent the thirty-four years since the band's demise dabbling in some projects but mainly sitting around waiting for a time when Plant may finally want to work with the band again. Jones, in keeping with his personality, wants to be included (even after such hurtful snubs as Live Aid in 1985 and the Page/Plant tours in the mid-1990s) but has at the same time carved out a respected and successful career both as a member of Them Crooked Vultures as well as an in-demand arranger and producer. One thing that struck me, however, from reading this book is that, contrary to what I had thought for many years, these guys weren't particularly close as friends...certainly not in the sense that other bands such as the Beatles, Who, or even Rolling Stones were, bands that had some nearly unbreakable personal bonds. Plant and Bonham had a friendship that dated back to their teen years in Birmingham, but Page was quite apart and withdrawn (his songwriting partnership with Plant the exception) and Jones often found himself the odd man out (partially down to his quieter personality) and was happy to spend time on his own and with his family. Another revelation was just how out of control Bonham was while on the road from the very early days. While I'd known that in the later half of their career his behavior was an issue, I had no idea it went back as far as the early 1970s and that it put a lot of strain on the viability of the band. He was terribly homesick and hated being away from his family for long stretches, but this manifested itself in some pretty terrible behavior...beyond the usual drunken hijinks and destruction that his fellow madman drum god and friend Keith Moon of The Who also indulged in. Bonham's behavior, often in cahoots with Cole, took a much darker, violent, and depraved turn. The one thing that saved him, however, was the music and the grounding his family gave him when he got back home. Finally, while Peter Grant's reputation as a hard-nosed and no-nonsense manager whom one didn't want to cross is well known, his proclivity to resort to frighteningly violent behavior, especially as the 1970s wore on and his addiction to cocaine deepened, was shocking. When contrasted with the more sensitive and kinder aspects of his personality, it made him more of a conflicting figure than he was before, at least to me. As far as the style of the book, it's quite enjoyable to read and while I've read several critiques of the way Wall writes in the first person when offering his insight or opinion during the recounting of a conversation he's had with one of the band, I had no issue with this. In fact, quite the opposite...I felt that it added detail and perspective to the tale. Also, while he's clearly a fan, he's not shy in discussing the more unseemly aspects of their career and he tends to be fair with his praise and criticism of their albums (which, for the most part, I agreed with). Lastly on these counts, he doesn't shy away from discussing Page and Plant's tendency to "borrow" musically and lyrically while not giving due credit where credit is often due. Now, getting back to the italicized passages I mentioned at the beginning of this review...when I first read the author's description of them in the introduction, I had trepidations and was sure I would dislike them. By the time I finished the book, I fell somewhere in between loving them and hating them. While the information contained therein was enlightening, mainly as it offered background tidbits of information on the pre-Zeppelin activities and careers of the four band members and Peter Grant, and the second person voice it was written in was harmless enough, it got annoying when a lot of slang and dialect was thrown in to what seemed like almost gratuitous effect. This was particularly the case with the "Brum-isms" of Plant and Bonham, which I felt were overdone. On the one hand, since this was the author using the information he'd gathered and imagining the actual things the guys might have said, I could remind myself that they didn't really say all of this. On the other hand, it got a bit silly and almost impossible to suspend disbelief enough to think they would have even talked this way (except, perhaps, for the case of Grant, who is well known to have spewn forth vast quantities of profanities with ease). For me, these passages (and a few scattered typos and minor inaccuracies) were the only things that detracted from an other superb book. As befitting a band of their stature, I am secure in my opinion that When Giants Walked the Earth is the definitive biography of Led Zeppelin. While there are several excellent books available (many of them in my personal library) discussing the band's music, previous attempts at telling the whole story fell short for a variety of reasons. While this book isn't perfect (and let's be honest, how many are? ), it's close enough and of high enough quality that, if you're a serious fan of Led Zeppelin, you need to have this book. I read the book several months ago, and thought it a good read, one that captured the ‘personality’ of the group, if such an thing could exist. The book certainly had a decent amount of information on their professional lives, and some on their personal lives, particularly Page’s. I don’t recall there being much written on the nature of the group’s music or musicianship. The one issue I had as well was with the interludes told in the second voice by the author. They seemed contrived, particularly the ones in the Brummie slang. Though they may have been based on facts, it isn’t easy to recreate the thoughts of another person as they describe episodes in their lives, let alone recreate the thoughts of the four different band members and their manager. In the end I thought the interludes detracted from the content of the book. I'm with you, the second person accounts were pretty poor...not a device that worked particularly well for the author. Some interesting bits of info about their pre-Zeppelin musical adventures but otherwise, lame. And yes, that's the video he was referring to when Page said he wanted to be a biologist, although I remember reading years ago that Page claimed he said that in jest? Either way, I've always thought that was a pretty neat little video. I thought the part of the book covering the post-Zeppelin years was really interesting, especially capturing Plant's attitude to it all vs. Jimmy's yearning to reform the band all these years.